There are three words environmentally conscience homebuyers love to hear: adaptive reuse design. The idea that an existing building can be transformed into a functional space once again is the guiding concept behind many of the buildings on Pine Avenue, including Courtyard Lofts, which was conceived by local architecture firm Studio One Eleven. Another Long Beach based architecture firm Interstices then realized and completed the project in 2005. 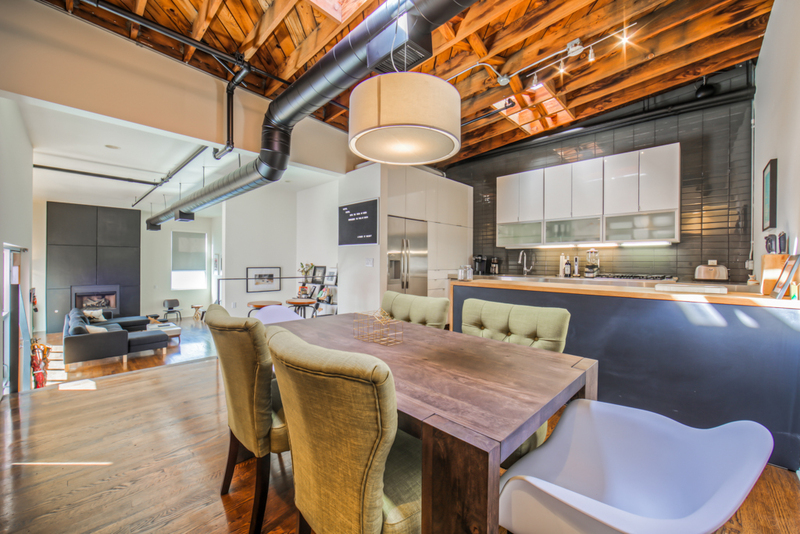 Located on the north end of the downtown shopping district at 849 Pine Avenue, Courtyard Lofts joins The Walker Building and Kress Lofts as one of the most successful adaptive loft housing projects in the city. In 2009 Courtyard Lofts was awarded the American Institute of Architects National Housing Award for the innovative design, which features floor plans ranging from 800 to over 1,400 square feet. The complex includes 16 contemporary residential lofts, each with a semi-enclosed patio, surrounding a central courtyard garden that was formerly a commercial parking lot. The design is unique in that it encourages a community atmosphere by facing all lofts toward the shared courtyard that acts as a tranquil retreat from the city. The interiors are sleek with clean lines, bright white walls, modern fireplaces and large windows that let in plenty of natural light. Some units feature original arched open beam truss ceilings spanning the entire length of the living area, that along with blond bamboo floors create a dramatic yet warm and intimate space. In addition to making use of the original mezzanine and concrete blocks in the existing structures, Interstices was conscious of building with materials that would be sustainable and affordable, such as Trex, a high-performance composite wood alternative, which was used to create the private balconies. 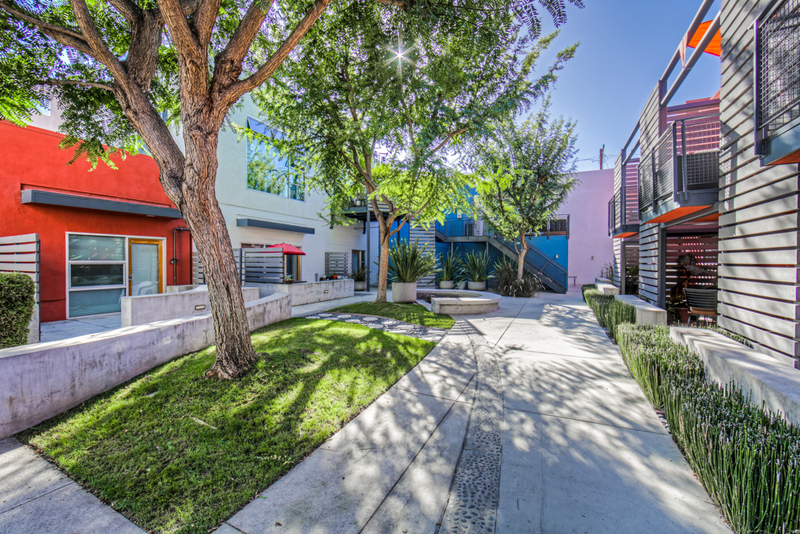 Although the exterior of Courtyard Lofts is a contemporary design, Studio One Eleven mentions that the project “has its roots in Southern California’s traditional courtyard housing.” Part of its charm is the fact that its bright colors and bold shapes are a slight nod to the mid-century modern aesthetic, another recognizable Southern Californian staple. It’s a reminder that these homes are truly a blend of old and new, both in design and physical structure. 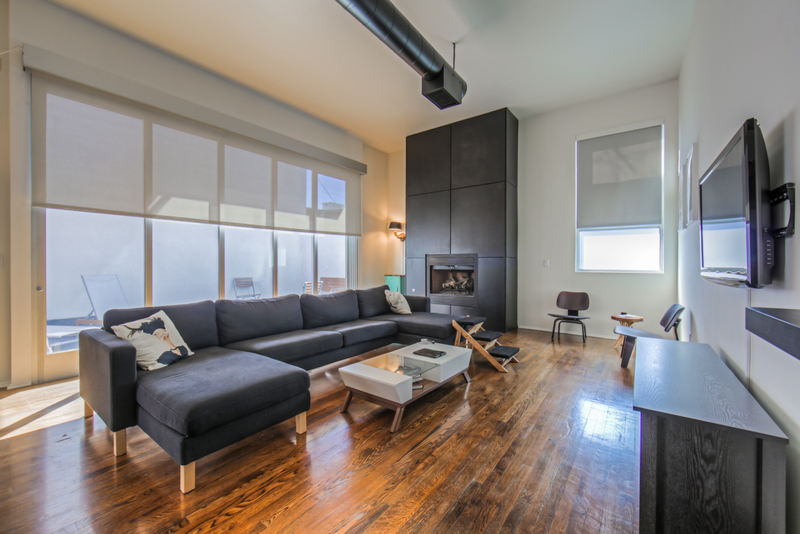 If you’re looking for a unique living experience in downtown Long Beach and you love the idea of adaptive reuse, contact Will Hainlen at 562.726.3802 to find out about lofts on the market. To search the entire Long Beach area, visit DomaSoCal.com or contact us directly at 562.481.3800.